With the U.S. at war, campaigns to support military mobilization and the national economy sprung into high gear. 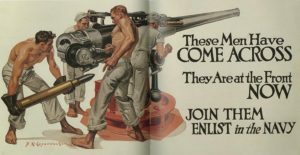 Conscription was approved in early 1917, accompanied by a vigorous campaign to register men with their local draft boards. 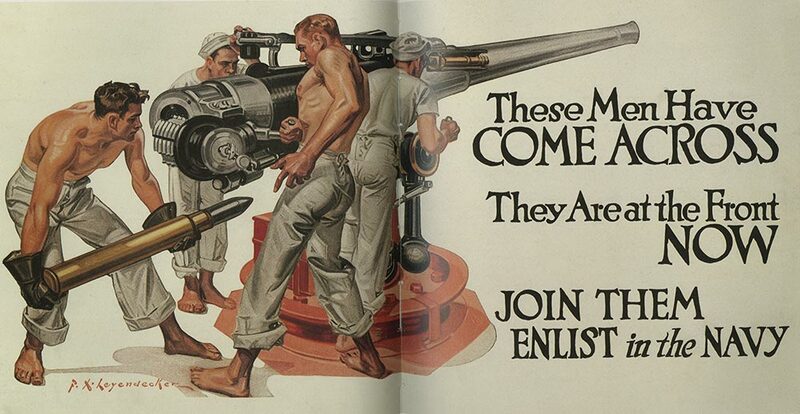 Recruitment efforts, like this Navy poster, promoted war service as a mark of masculinity and patriotism. 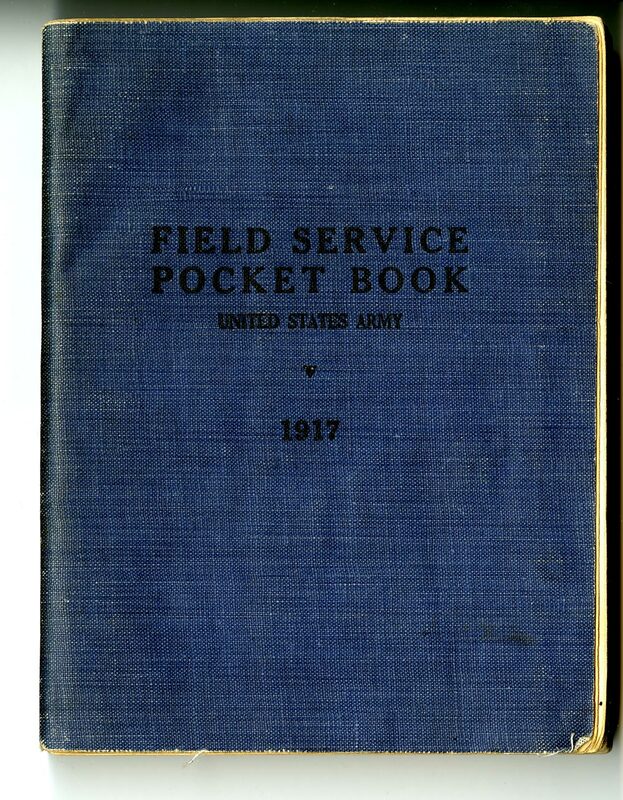 Most servicemen abroad were part of the American Expeditionary Forces (AEF), the military entity created for U.S. coordination with its World War I allies. 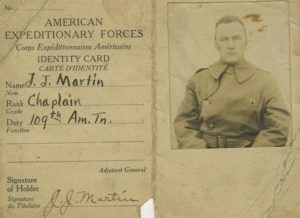 At least twelve DePaul faculty members enlisted as the U.S. entered the war, including many Vincentian priests who provided religious services. DePaul’s second president, Rev. John Martin, C.M., served as a chaplain in the American Expeditionary Forces in New Mexico and France. 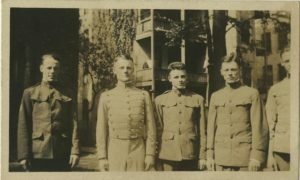 Like many in the DePaul and Lincoln Park communities, five of the Ward brothers entered military service during the Great War. Oldest brother Harold rose to lieutenant, serving on the 108th Ammunition Train in France with brothers Cyril and Oliver. Albert graduated from West Point to become a lieutenant in the 31st Infantry, while Robert served stateside in the Navy. 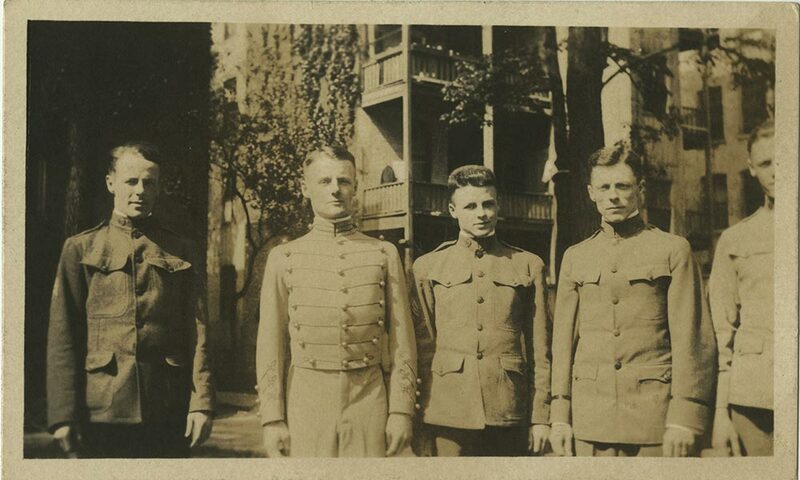 The boys, pictured at right, may be posing near 513 Fullerton Ave., where the Ward family had moved by 1917. Oliver Ward’s unit left for France in the summer of 1918. 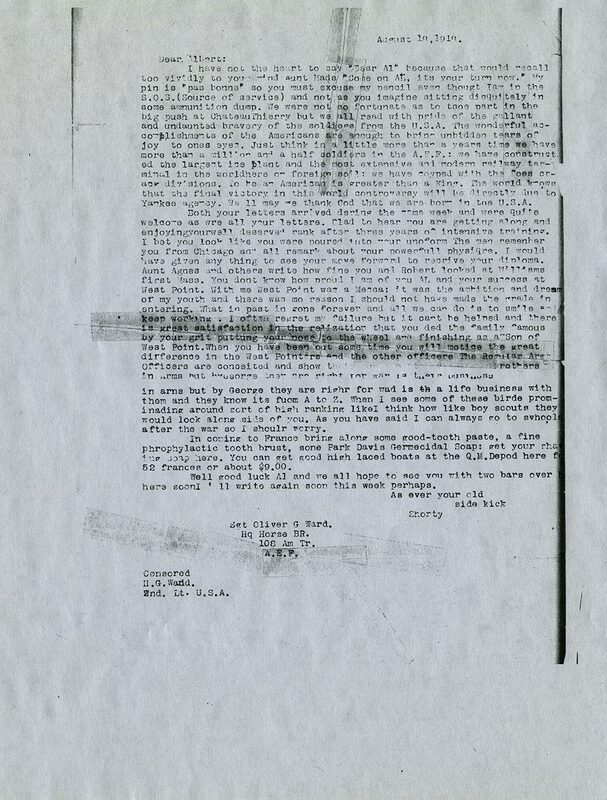 He wrote to his brother after Albert’s West Point graduation, advising him about military life abroad. A note indicating “Censored, H.G. Ward, 2nd Lt. U.S.A” suggests older brother Harold, also with the 108th Ammunition Train, was Oliver’s superior officer. 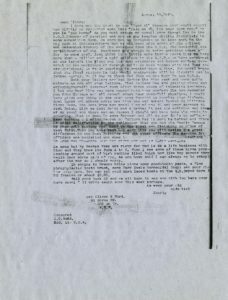 Officers censored letters, sometimes retyping written notes, to prevent troop locations, mobilization details, and critical assessments of the military from spreading. Oliver’s letter alludes to the big impact that small comforts—like a toothbrush and good boots—can make on a soldier’s daily life. 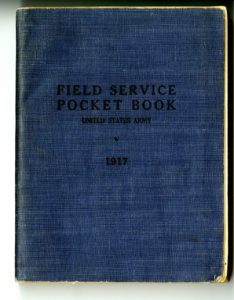 The U.S. military issued this Field Service Pocket Book as a reference for basic procedures and guide for conditions expected in Europe. 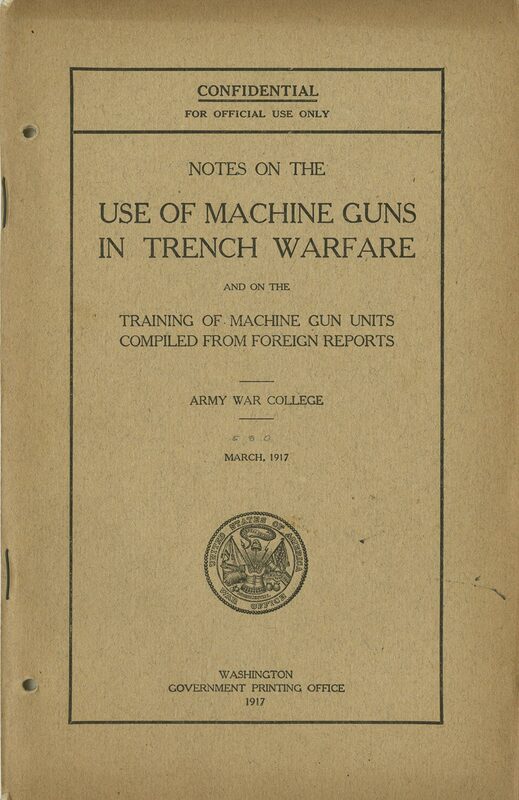 The 1917 manual covers everything from caring for your feet, to protecting against asphyxiating gas, to using carrier pigeons to send messages on the battlefield. Many servicemen were new draftees, and this manual, like Oliver’s letter to his brother, was full of indispensable advice about life at the front. 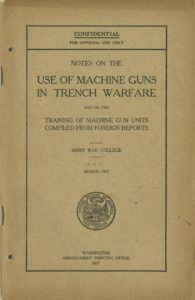 More specialized than the Field Service Pocket Book, the Trench Warfare manual gives detailed instructions for digging trenches constructed to house machine guns. 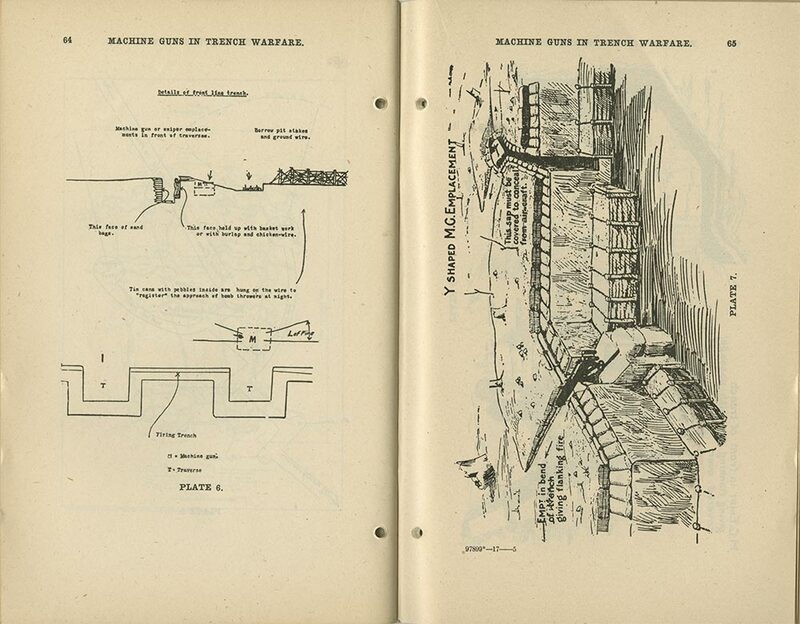 Trench warfare came to define the lengthy and deadly impasse along the Western Front during much of World War I. 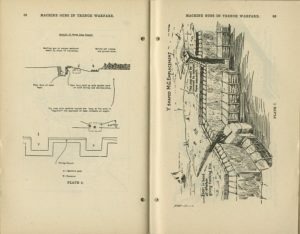 The U.S. Army College’s confidential training manual on trench warfare was full of illustrations and descriptions to guide the soldier.